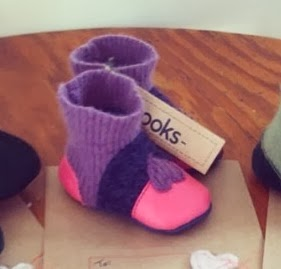 A Little Blueberry: Nooks Footwear Review & Giveaway! Nooks Footwear Review & Giveaway! 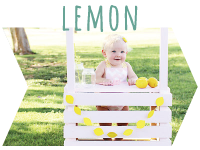 I am so excited to have the opportunity to review a pair of Nooks Footwear booties (for Lemon) and slippers for me! I had seen these boots for babes all over Instagram and wondered who made them and what they were all about. Little did I know that they were run by an awesome mama who uses repurposed materials to make them, and handmakes each pair! And I also had no idea she made adult sizes - wooo! 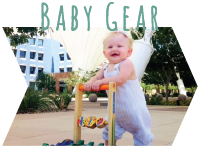 Scroll down to see how you can win a pair for your baby/kid! From re-purposing leather into stylish change purses for Canadian design company Smoking Lily, to making custom socks for clients on the Downtown Eastside of Vancouver, I’ve always had a love for up-cycling natural materials into beautiful and practical creations. Nooks Footwear began with a visit to Kelowna’s downtown thrift stores on a cold December day where there happened to be an abundance of outdated wool sweaters; I knew I could re-use them to make some great new items. Patterns for baby booties were soon developed and the first pair of natural fibre, up-cycled Nooks booties were on my daughter’s feet, keeping her cozy. Friends showed interest in also having natural, stylish and unique footwear for their children that would be easy to put on and would stay on. And so Nooks Footwear was born and has been growing organically through word of mouth and social media ever since. Thanks to feedback from customers at local farmers’ markets and from online customers, the style and construction has been fine-tuned. 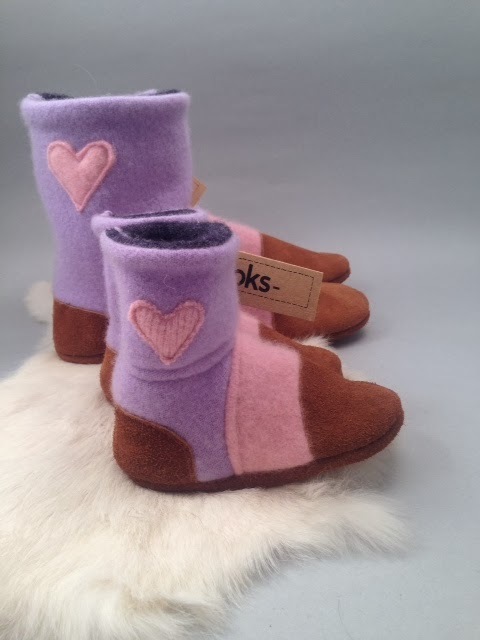 Today, Nooks Footwear has grown from baby-sized booties into a full line of products ranging from newborn to adult sizes. Nooks Footwear is committed to continue sourcing great materials, developing new and innovative styles, and growing a sustainable business locally in Kelowna, BC. Whether you’re interested in toasty slippers for yourself, booties for your children, or unique and practical gifts for friends and family, you’ll surely be able to find a pair of Nooks that fit the season, your budget and your style. My name is Ruthy Penner and I'm the owner and designer of Nooks Footwear. My partner and I live in sunny Kelowna, BC with our 2 year old daughter Anouk. Being a stay-at-home mom means that I operate my home-based studio mostly in the evenings and weekends, but I still get to drop off parcels for customers at the post office and go thrift store shopping for materials during the day with my daughter. Finding work-life balance is always challenging, but with the help of a great team and my partner who helps me out with marketing and communications, we've been able to find success in the first year of operation and there's no sign of slowing down! Even though sleep may be getting compromised in trying to do it all, there's no better feeling than doing what I love and feel passionate about. 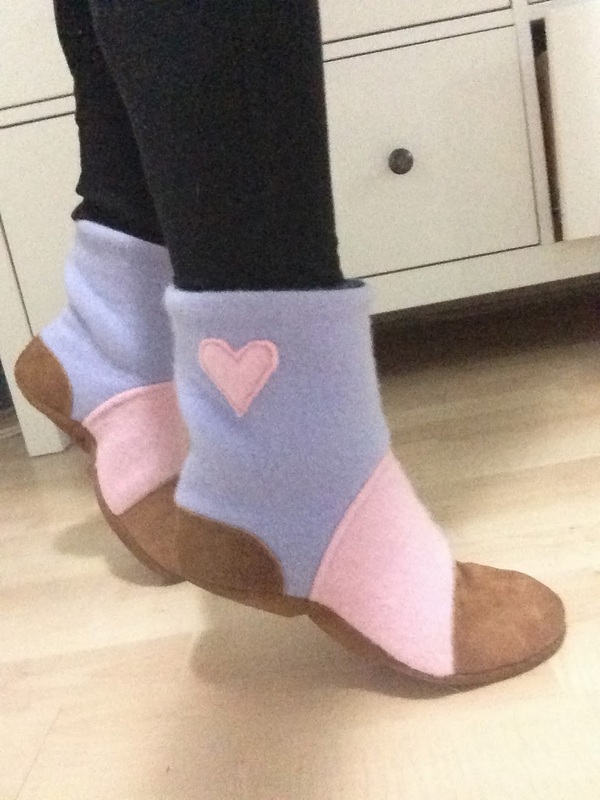 Ruthy sent us a custom made, matching pair of booties and slippers (in my requested color/style) and I absolutely love them! 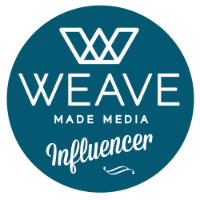 She also sent me some wool inserts ($18.54 US), to make my slippers more comfy, and a friend recently bought Lemon one of Ruthy's upcylced, handmade dresses ($40) - another awesome aspect of her business. All of her items are made from repurposed materials and you can even send her old items of yours, or your babe's (like their baby blanket!) 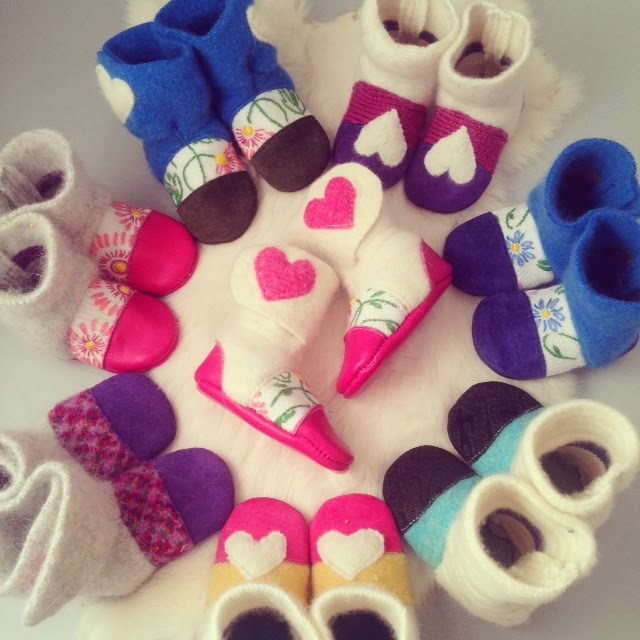 for her to make booties, slippers or a dress out of - how cool is that?! I love small, family businesses and I LOVE re-purposed materials - it's so awesome that she doesn't let anything go to waste! 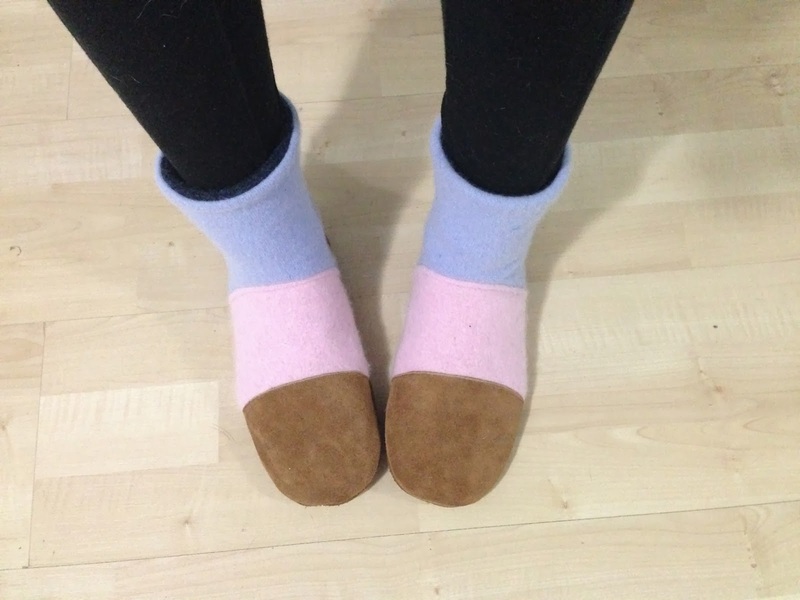 Our slippers are made from pink and purple wool, with a pink heart, and brown suede bottoms and toes. Mine are unbelievably comfy and fit true to size (I ordered a size 6.5, 9 inches, $60), although I kind of wish I would have gotten a half size smaller because I feel like they will stretch after a bit of wear (and since I'm in AZ I'm not really wearing them with socks). 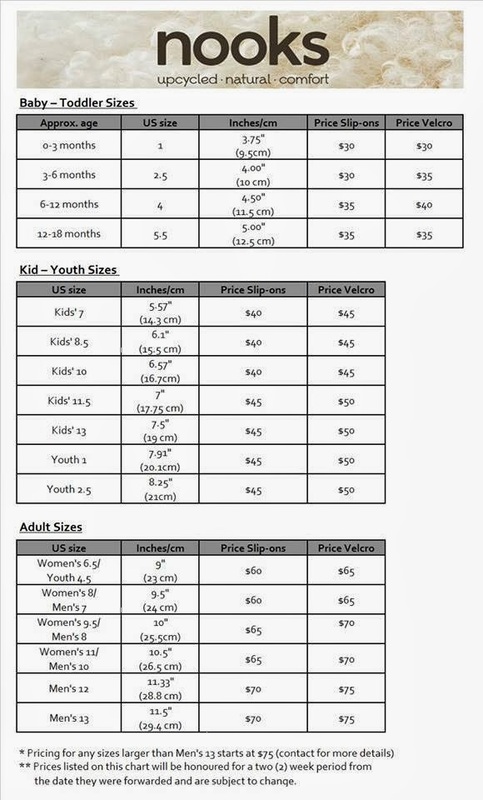 This is the smallest Womens' size that she offers, and if you want to go smaller (measuring 8.25 inches) you are into Kids' sizing for $45 (kind of a deal if you have small feet!). Lemon's boots fit perfectly, I ordered a kids' size 7 (it measures 5.57 inches) so that she would have some room to grow (her foot measures 5.25 inches). Even though the booties are a bit big the way I ordered them, they don't slip off her foot or seem uncomfortable. They are the slip on style ($40) and are super easy to get on but stay put when on her foot and she seems to like them! They have thick, suede bottoms and toes, perfect for a walker, and aren't slippery even on our hardwood floors. They are also super cute with leggings, on a babe, and even with a dress! I just wish we had more of a winter here so Lemon could fully enjoy these, we are going to have to chase a storm up north this weekend so she gets some wear out of them (it has been unseasonably hot in AZ this winter). The mornings are still cool, however, and these are great for around the house so her toes don't get cold. Socks are so slippery, on our floors, so I'm happy I have these to put her in at home when it's colder when she gets out of bed. Overall I would totally purchase another dress and pair of boots from Ruthy at Nooks Footwear. Although we did not try the velcro boots, I am sure they fit and are made just as well as our slip on pairs, and fit true to size. Our boots are super comfy, so stylish (that I would wear them out!) and Lemon's dress is to die for. Ruthy is amazing at what she does, does it with integrity and the fact that she's using repurposed materials means she cares about the environment and lets nothing go to waste. She is great to deal with, quick to respond to all emails and questions/comments on IG and is building an awesome business. I am confident that Ruthy will be doing this in years to come and will be SO successful at this venture - her clothes/shoes are made well and you can tell she puts lots of love into them. Go and get yourself and your babe a pair ASAP and try to snag one of her weekly dresses - you won't be disappointed! Winners will be chosen at random on Saturday, March 1st at 12pm MST. 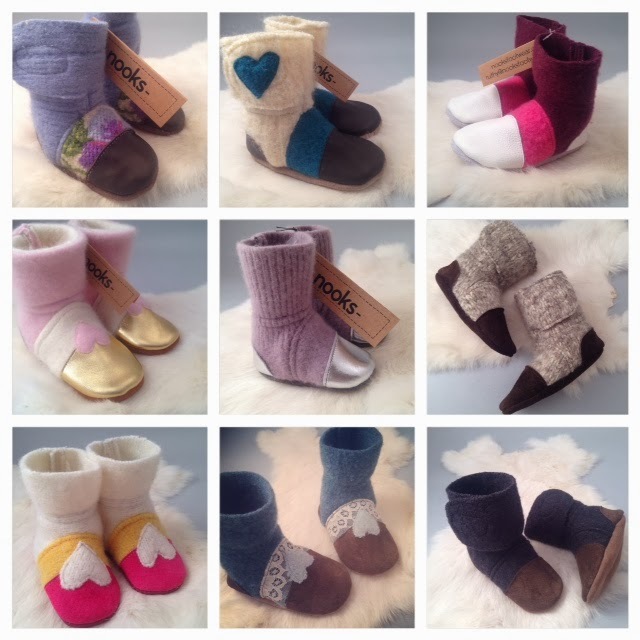 If you win, you can choose any pair of Nooks Footwear booties listed in her Etsy shop for your babe. Good luck!! 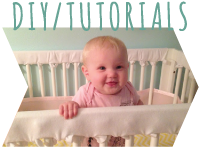 I would love yo win a pair of nooks because they look very comfortable and soft for my little one , thank you for the oportunity. I'd love to win a pair for my little cutie! Wow those are REALLY cute! Love them!! I want to win a pair because I've been in love with these boots since seeing them all over Instagram! I went to buy a pair back in December but ran into some financial trouble and never got the chance. Now with planning a first birthday, this would be an amazing gift! 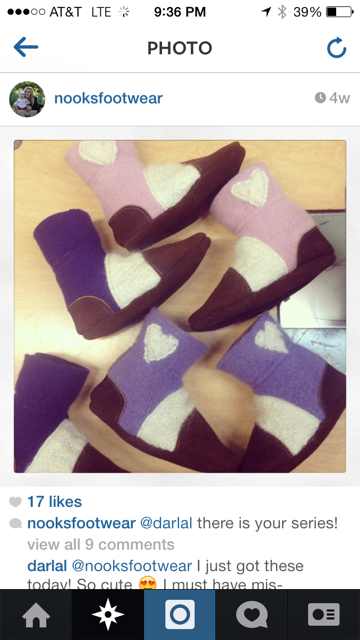 Would love these booties for my little one! She is an early walker and these would be perfect for her to wear on slippery floors. I've been oohing and ahhing over these on Instagram :) thanks! 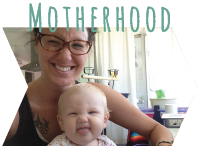 I would love to win a pair of Nooks Footwear for my little man. He would totally rock these. I have been meaning to get some for him. I have been eyeing them for awhile now. These also would be great for baby #2 due in September. Thanks for having the giveaway. I also Reposted on Instagram and private. Lemon is such a doll. gosh those booties are darling! and so is your little girl! 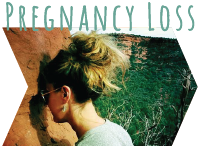 i'm a new follower and i am just taking it all in :) can't wait to get to know you and your little family better! I would love to win a pair of these for my daughter Mollie. I love that this is a Canadian business, and that she up cycles her materials. Stylish, cozy and environmentally conscious is right up my alley 😊. GFC JACLYN and these are adorable!! Cute and lovely.Thank you for publishing this blog I'm really impressed! Very smart and creative i'd really like to have one of that nooks booties.